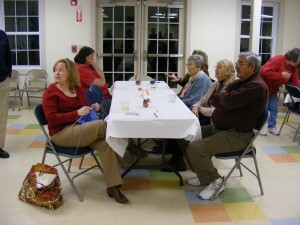 Chatting while waiting for the blessing and the beginning of the Stewardship dinner. 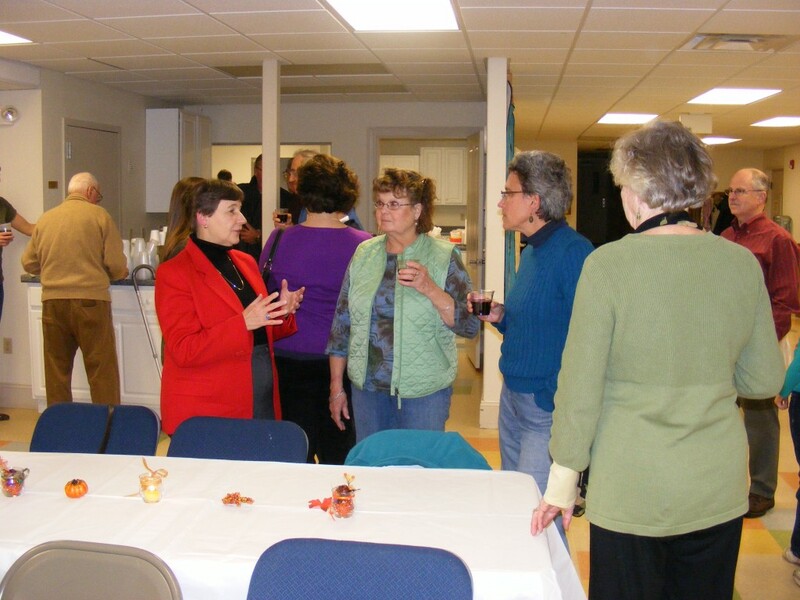 The parish gathered on November 19 to celebrate the end of our Stewardship Campaign with a potluck dinner and a raffle. 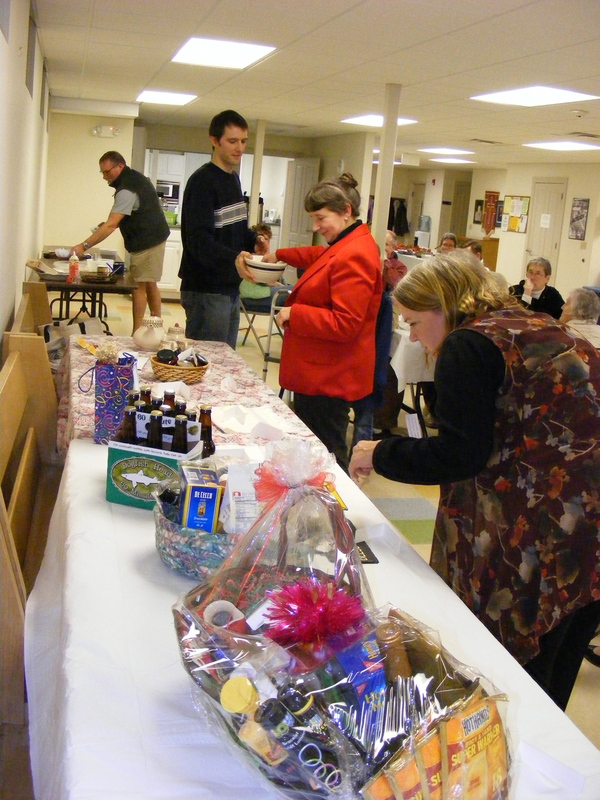 Lots of food and fellowship was shared, and the raffle doled out some fun, interesting and useful prizes. It’s always a good time when the Holy Cross family gets together for a meal and a good time. Lots of fun prizes were raffled off to folks who made a pledge for 2012. Lots of yummy food was consumed! The best part is being together for a time. 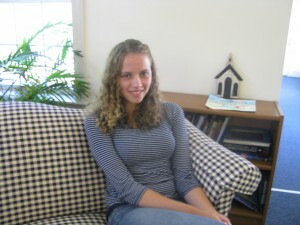 Published on November 10, 2009 in People and Stewardship. Closed Tags: ministry minute, Richard Harbour. Richard Harbour (second from left) takes a break from cooking at the chicken barbecue. I’ll begin by taking you back to 1935. 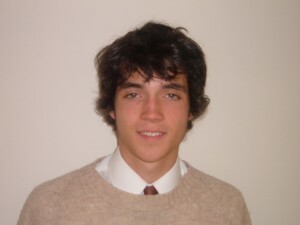 I was a Roman Catholic. My Mom and Dad were French Catholic all their lives 90 some odd years. Then when I became a young man and I wanted to have a family of my own, I wanted them to go to the Roman Catholic Church. That lasted 24 years until I got divorced. Which changed my life. A couple of years after that I met Ellie and she changed my life again – for the good. But in my mind there was a big void in my life, I went on with day-to-day life, but didn’t have a church. Then, Ellie and I decided to go to the island of St. Martin in the Caribbean. We’d gone to several other islands and enjoyed them, but the first night we were there, we walked to a restaurant, which you could see from the hotel and we heard a roar come up behind us and a man jumped out and put a 9 millimeter gun in my belly and demanded all of our money. He grabbed Ellie’s bag off her shoulder. When we got back to Rhode Island, where we were living at the time, we were asking, “Why did it happen to us?” That man wanted to shoot me, but he didn’t. We felt we had an angel on our shoulders, And decided it was time to find a church. We went to St. Matthias and met Father Morgan and it was so close to the Roman Catholic Church, I felt very comfortable with it. 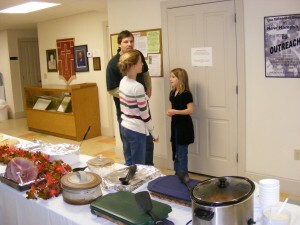 Ellie and I became part of that church family for about six years, and enjoyed doing things for the Church. Then we decided to move back to New Hampshire. We searched about 20 towns and ended up in Hillsborough, of all places. Then, it was time to search for a church. Hillsborough didn’t have an Episcopal church, so we tried a couple of Episcopal churches in nearby towns, but they didn’t feel right for us. Then we heard about Weare. 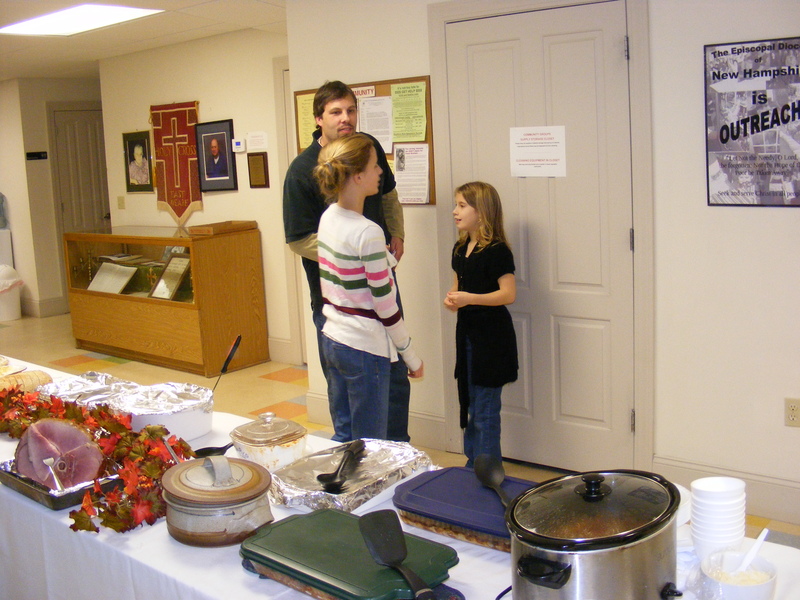 Ellie’s brother had helped move the old church from East Weare to Weare Center years ago, and bragged about that, so we had that connection. A couple of days later Father John was sitting in our living room, explaining things to us about Holy Cross. I enjoy Father John and his sermons very much. I feel apart of our new church building because I worked on it … painted the posts, and am proud that I was asked to help build the Altar and built the kneeler in front of the icon. I feel good about mowing and raking the lawn because it’s for the church. We have some great people here… talented people here. In Rhode Island, I was the only one that would read the lessons and here there are a dozen and more people who read – not that I want to read, you all do fine. 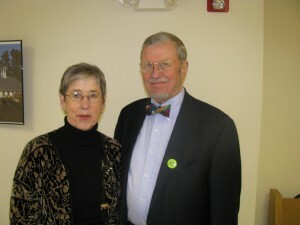 I’ve met some wonderful friends – John Heckman, Don and his wife, Marge, and all of you are great friends. I’ve seen kids grow up … mothers brought them in cradles and now they are practically grown up … I think Laura Arvin was one of the mothers. Published on October 28, 2009 in People and Stewardship. 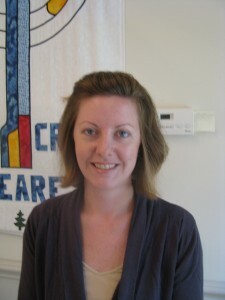 Closed Tags: kathleen kenyon, ministry minute. There is one word that encompasses my reasons for being here at Holy Cross – that word is “Balance” The last few years of my life have been like sitting on the low end of a see-saw, kind of stuck, not moving, just sitting there on the ground, not getting a chance to really enjoy the ride. I came to Holy Cross to find “balance”. Now, I hover a little higher on the see-saw and sometimes I even get to soar to the top. 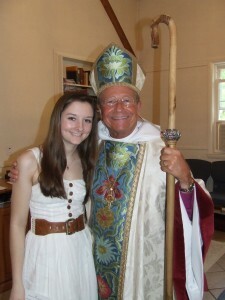 I enjoy the sermons, the wonderful people, the parish itself, and its history. Being here at Holy Cross helps me to unload the week’s trials, the past that still hovers, the pressures of life and to give myself this time to reflect and to find the balance I seek. Holy Cross and the people I’ve met here at this parish have helped me rediscover those wings. 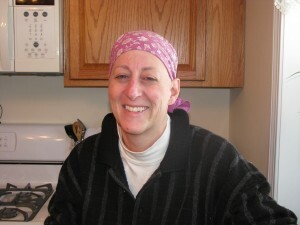 Note: Kathleen has been battling a rare form of cancer. Her courage and determination to give to others even as she works to heal herself has been an inspiration to all of us. Published on March 28, 2009 in People. Closed Tags: David Roy, People. Published on March 28, 2009 in People. Closed Tags: Joe Harrington, People.